A strong cultural identity is widely acknowledged as important for Aboriginal and Torres Strait Islander health and wellbeing, and the recent Congress Lowija showcased some inspiring projects. 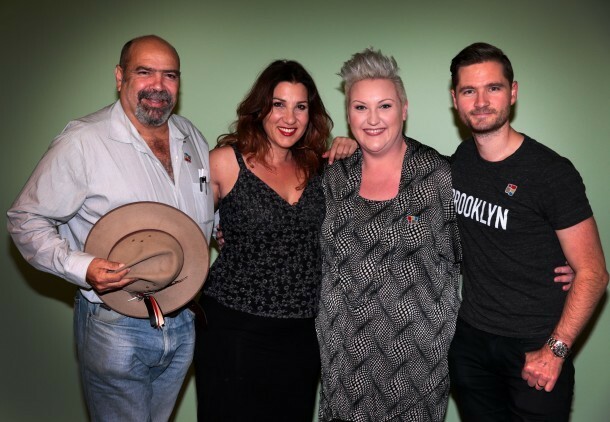 A chance meeting outside a country town hall inspired a new project for the Stiff Gins – one of Australia’s most popular Indigenous singing groups – and led to an extraordinary musical encounter with the past. 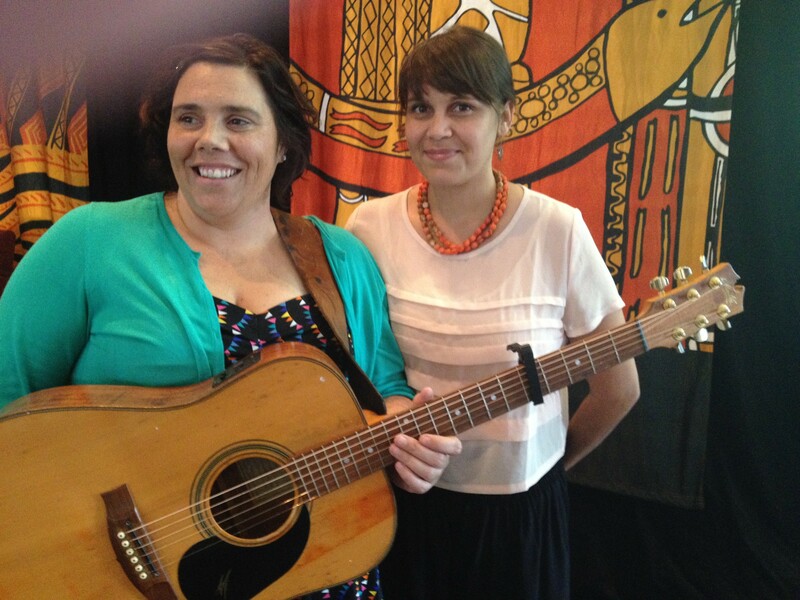 The Stiff Gins – Nardi Simpson (to the left in the photograph) and Kaleena Briggs – told the “culture, identity and health” session at last week’s Congress Lowitja 2014 that they had been performing at a festival in a small town, and saw a treasured Elder sitting on the town hall steps. He told them he was supposed to have given a talk at the festival about his life “but no one came”. It hit them both: Briggs had just lost her grandmother and she remembered someone telling her: “When you lose an Elder, you lose a library”. So they caught up with him later in a cafe to hear the stories he’d planned on telling. “He was talking about objects, how they retain stories: (how) you walk through a place and the very rock is imprinted with your footsteps,” Briggs said. It captured their imaginations and their thirst to write songs – after playing together for 15 years – that went beyond their own experiences. They thought if natural things like trees and rock and country can record sounds and songs and stories, then surely handmade cultural objects like boomerangs, shell pendants, fishing nets or clapsticks also carry the essence of the people who crafted them and where they’re from. Simpson had worked at the Australian Museum and knew well the storage shelves filled with items that almost no one ever gets to see. 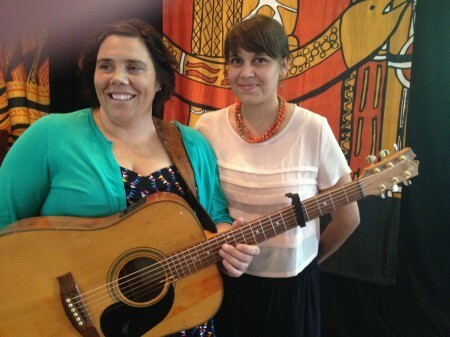 They got permission to sit amongst the Indigenous collections for three days and so was born The Spirit of Things – Sound of Objects – a research, history, arts and cultural project to “explore residual and embedded stories and songs retained in Aboriginal cultural material” and to send them back out into the world in new songs, writing and art. Heading then to Tasmania for a gig, Peter White, the senior curator of Indigenous Collections at the National Film and Sound Archive (NFSA) recommended they check out the story of Fanny Cochrane Smith. A noted singer, in 1899 she made this extraordinary wax cylinder recording of Aboriginal songs – the only audio recordings of an Aboriginal Tasmanian language in song or spoken word. (The recordings and the photo above are held by the Tasmanian Museum and Art Gallery (TMAG)). When Simpson and Briggs reported back their excitement about the recording, White suggested they pay tribute – onto wax cylinder. They wrote a song that invokes the story of a honeyeater called Durroeee who is the returned spirit of special women who have proved themselves kind, generous and strong. “We see Fanny as that bird for us,” Simpson said. Here’s the finished product, Dust, recorded in Wiradjuri and Yuwaalaraay language. What comes next is writing and producing a show to frame the experience, songs, and sentiment of Spirit of Things, which they’re hoping to tour, with the objects, including overseas. “It’s funny because we turned to this project because we felt Stiff Gins as a musical entity was stagnating but since writing these songs, we have hit a song-writing purple patch,” Simpson said. The connections, it seems, aren’t over yet. In a fabulous postscript to their presentation, Simpson said the great grandson of Horace Watson, who recorded Fanny Cochrane Smith on the phonograph, was at their Lowitja talk and made contact. The session at the conference also featured three Ngangkari, traditional healers from the Ngaanyatjarra Pitjantjatjara Yankunytjatjara (NPY) Women’s Council in central Australia, and how they work in concert with local health services and to build knowledge in their community. “If you don’t walk on country, it dies, it needs kids to be out on it: kids and country gets ‘happy and healthy.” Elder Matthew Dembal Martin. Another research project highlighted at the conference is working to revive endangered songs and dances that are indigenous to much of the Kimberley area, which holds some of Australia’s oldest and richest performance traditions. The big focus is on the endangered Junba (corroboree), which University of Melbourne ethnomusicologist Sally Treloyn says is “one of the world’s most precious dance–song traditions” and brings people together with country and family, past, present and future. Ngarinyin/Nyikina community leader Rona Googninda Charles described the role of the Junba, as “part of the land, part of the sharing system between close tribes”. It uses lots of totems (“most of us live away from our traditional country so we carry country with us”), stamping (“to wake up sprit, make our country come alive”) and singing (“to echo up the hill country”). 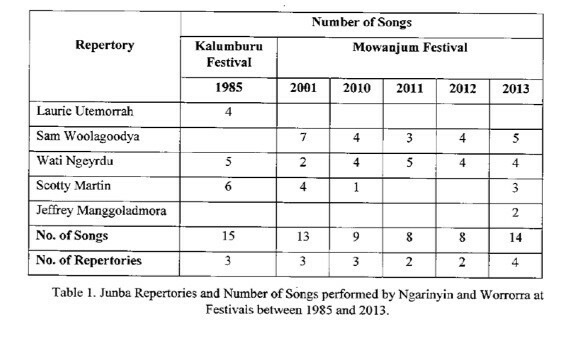 The project estimates that, since the early 1900s, some 1500-2000 Junba songs would have existed, with around 455 recalled more than a decade ago. Today, with the loss of many song-holding Elders, only are to 20-30 are regularly reported. 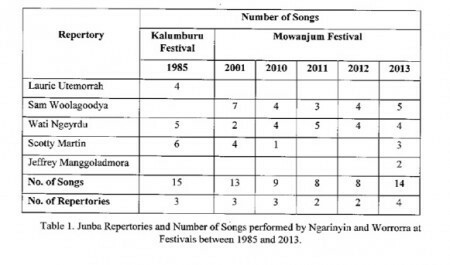 The number of repertories performed by Ngarinyin and Worrorra people at festivals declined from 15 in 1985 to only 8 in 2012. The Junba project has been taking up to five generations of local families off to Junba camps, to bring alive the traditions away from distractions. Digital technology is also helping, with children making their own mini Junba documentaries and transcribing Junba texts and elders using repatriated audio and video recordings of past performances to pass on stories. It has, they said, led to a small but significant revival (see table). Did you hear the one about the all-Aboriginal comedy show Basically Black that was screened on the ABC in 1973 (and included activist Gary Foley amongst its performers)? Chances are you probably didn’t – though you can watch a snippet of it here. A watered down version of a Nimrod Theatre stage production, the one-off show apparently was a success but not enough to make the ABC proceed with a planned series. Seeing it screen at a special comedy show – ‘Is racism the new black?’ – that was staged last week as part of Congress Lowitja made comedian Charlie Pickering wonder about the “lack of progress” in Australian broadcasting that would make such a show even more unlikely these days. “I don’t know those guys, but if I’d known them all my life they’d be some of my favourite comedians,” he said. Luckily, she said, many more (one million plus) got to see this great piece on reverse racism by Bangladeshi Australian comedian Aamer Rahman and the classic takedown of white privilege by US comedian Louis CK. Still there are, the panel noted, great Aboriginal comedians now performing in Australia and internationally, like Kevin Kropinyeri and Sean Choolburra. But Laurie said she worked with Deadly Funny, an initiative to support and showcase Aboriginal comedians as part of the Melbourne International Comedy Festival, which was struggling to get people to participate. The multi-talented Richard Frankland said progress would really come when Indigenous actors, musicians, writers and comedians were chosen for their own talent, not their Indigenity. See a review of the event from The Guardian. You can track the Congress Lowitja coverage here. The TGA – a watchdog with dentures?